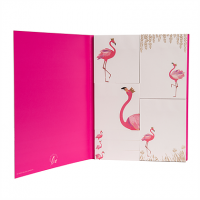 New from Caroline Gardner, this stand-out birthday card is bang on trend, featuring very much the bird of the moment, the flamingo. 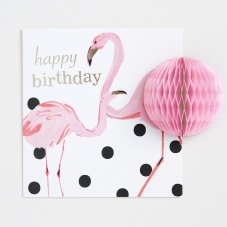 Amidst a sea of black polkadots and the words 'happy birthday', two painted pink birds stand tall. The Pom card range are large-size cards, each featuring a fantastic 3-D honeycomb pompom element that opens out to complete the design.